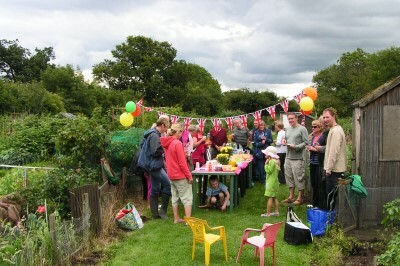 If you happened to pass by Acaster Lane allotments on Sunday afternoon you might have wondered what was going on – flags, food, and lots of people milling about without a garden fork in sight. Well it was the allotment holders summer party, which had been advertised with a poster on the gate as ‘2 til 4, if wet cancelled!’. Well at 2 it was dry, so as new allotment holders we turned up with a bag of sausage rolls, a bottle of wine, and the hope of getting a few tips about the broccolli (it’s all gone to seed this year). We were greeted by an enthusiastic group of gardeners who had also taken an optimistic view of the weather and brought along tasty cakes, pizza, quiches and the like – not a sprout in sight. After getting to know everyone we got down to the serious business of exchanging hints and tips, and discovered that for some reason carrots don’t seem to like growing in Acaster Lane. Does anyone know why? The weather then took a turn for the worse and tried to deter us with heavy rain and even the odd rumble of thunder. 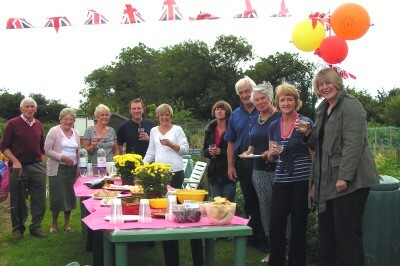 But allotment holders are made of stern stuff and we held the line and partied on. We were still there when the rain stopped and at 4 o’clock when things ended we made a soggy exit, the new owners of a gooseberry bush, a basil plant, and as much rhubarb as we could carry – plus a load of new friends.